* Developing learners to achieve results — improvement in school performance and self-image, and creating a basis for lifelong learning. * Quality and compassionate customer service. * Providing challenging and fun learning experiences. * Using tried and tested educational practices based on established theories. * Working professionally through proper business practices and fit-for-purpose computerised systems. * Edublox people enjoy amiable and value adding relationships. 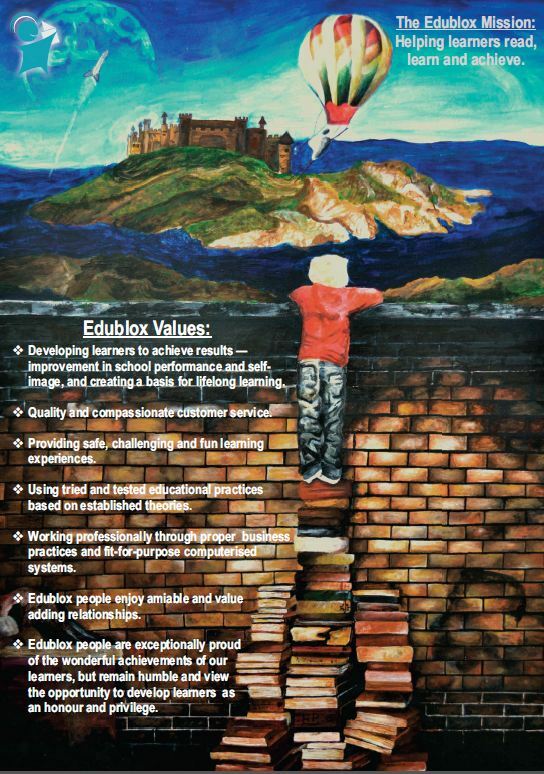 * Edublox people are exceptionally proud of the wonderful achievements of our learners, but remain humble and view the opportunity to develop learners as an honour and privilege.